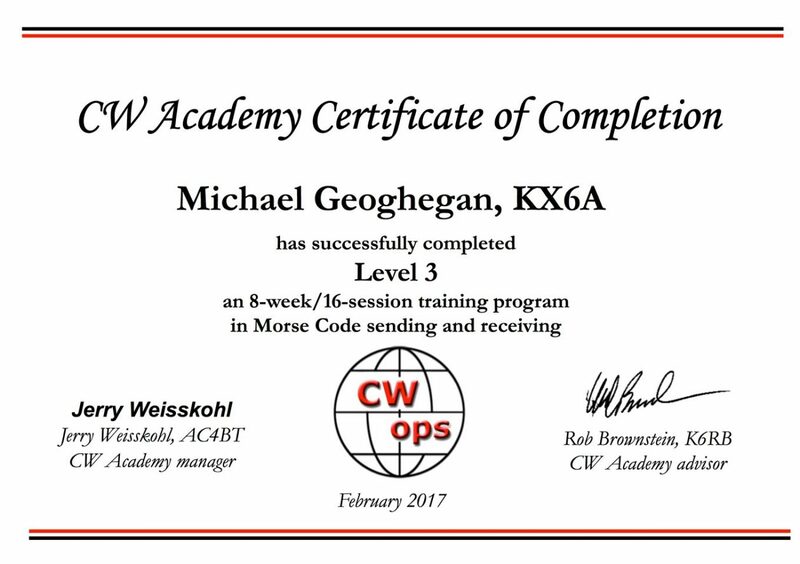 It has been a long road but after almost a year I have completed the full CW Academy schedule by graduating from CW Academy Level 3. I am amazed at the contest speeds I am now comfortable with. If you had told me a year ago that I would be able to comprehend CW contest speeds between 30-35 wpm I would have thought you were crazy. The CW Academy will get you there. As I’ve posted before: the Academy is free and taught by instructors who are passionate about helping people learn to operate using CW. Classes were held twice a week online with the instructor and a small group of students. There are three levels in the program with the ultimate goal of 25 wpm head copy. Thanks to my Instructor Rob K6RB who did a great job!